The flying machine looks something like a helicopter but it is quite different and is intended to be a future answer to the greening of noisy, vibration-heavy helicopters as we have known them. 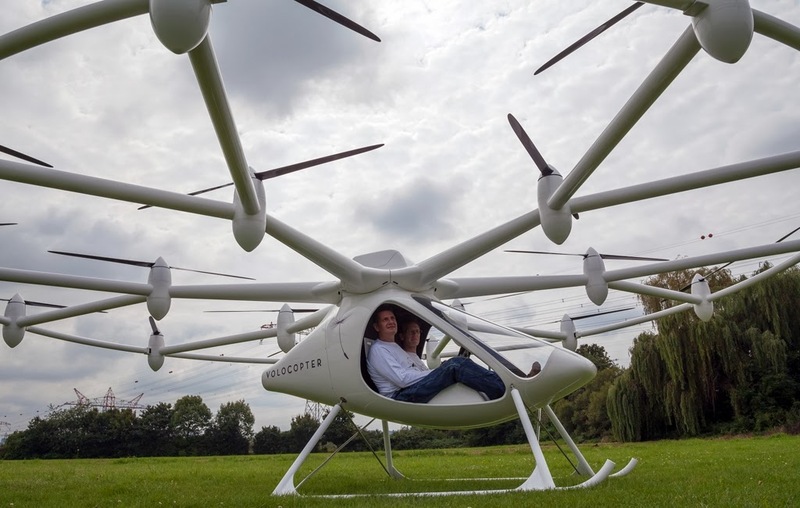 A two-seater prototype of the Volocopter, by the company e-volo, made its maiden voyage earlier this month in Karlsruhe, Germany. The team used a prototype of the two-person VC200. Based on this model, it will be prepared for series production. Billed by its makers as "the world's first green helicopter," the emission-free Volocopter is a vertical take-off and landing manned aircraft, with features that set it apart from conventional aircraft. For one, the machine, instead of being kitted out with one combustion engine, carries eighteen electrically driven rotors to propel it. Through the propellers, the Volocopter can take off and land vertically just as does a helicopter. The team responsible for the machine said the 18 rotors present a considerable advantage, apart from the simple construction not requiring complex mechanics. The advantage is said to be in the redundancy of drives. This enables the safe landing of the Volocopter even if some drives fail. During the first flights of the prototype in November, the team made note that the device had a lower noise level than conventional helicopters, confirmation of no noticeable vibrations in flight, and an efficient spring strut landing gear. Speaking about vibrations, e-volo's Stephan Wolf said that vibrations in the structure of a plane have been problems for normal helicopters, and that vibrations together with the high noise level have led to passenger discomfort but their "green" version resolves such issues. Wolf and Alexander Zosel, CEO, stated that "not even the HD video cameras secured to the exterior carbon ring of the rotor plane captured the least vibrations." The VC200 two-seater Volocopter plans involve the following characteristics: a cruising speed of at least 54 kn (100 km/h); a flight altitude of up to 6500 ft; maximum take-off weight of 450 kg; and more than one hour of flight time. (At present, a battery flight time of 20 minutes is possible, according to the company site, but in the near future this will be extended to one hour or more.) E volo was the winner of the 2012 Lindbergh Prize for Innovation. "We believe that the development of the Volocopter holds significant promise to radically change short distance transportation," said Erik Lindbergh. "It has a long development path ahead, but if this innovative design reaches the commercial market it will dramatically change the way we move about the planet." As for safety, the team notes that an integral part of the safety of the Volocopter is the redundancy of its components, such that the Volocopter is safe to fly even if several drive units fail. (Even if the range extender fails, a safe landing is ensured by additional batteries.) The Volocopters are fitted with a parachute that lets the entire aircraft sink to the ground in the case of an emergency.